I know many of you are using this utility and I had to use that myself at my project. This was done to properly update a dimension. It had alternate hierarchy and there was member movements too. I had to delete the alternate hierarchy and then load the main hierarchy first and then the alternate. 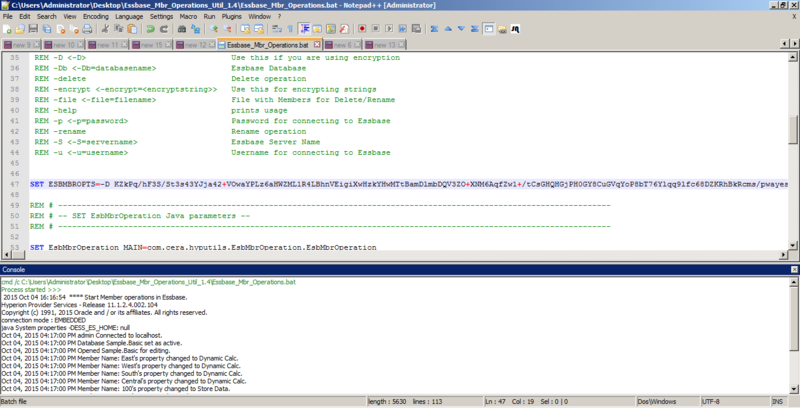 I didn’t like the idea of exposing the credentials on a production system and had to add encryption. Here we are, you can now encrypt the options and pass that in the bat file. (Yeah I don’t like just encrypting user name/password only). If you are choosing encryption then you’ve to encrypt the whole string. java -jar EsbMbrOperation.jar -encrypt="-u=admin -p=p@ssword -S=localhost -App=Sample -Db=Basic -file=C:/PropMbrList.txt -changeproperty"
I’m adding an option which will help you find out all potential Implicit Shared members in your cube. You’ll have to use export MaxL to export your outline as an XML file. You can read more about export outline here. Extract the outline, I used a modified version of Sample Basic for this. Update the bat file and there you go. I did run this on a outline extract which has close to 1.4 Million members and it was done in 2 minutes, so it is fast!!!! Would you mind if I had a slide in my Hybrid presentation at Kscope16 that talks about using your tool to change a dimension to be dynamic calc? Tim told me about your utility at Kscope. I'm trying to use it to convert my outline to dynamic calc for Hybrid. I've setup the utility as described, it connects to the app but then gives java exceptions, saying unknown member. Cost Center, Dynamic Calc is in my file. I tried count and rename, both didn't error out, but my outline didn't get updated. When it errors out, it leaves my outline locked. So I know its getting to my application fine. Let me look at it. It might be because the member name is having a space in it. If you have the name wrong, or if you have multiple dimensions and either the name is wrong or the storage option is wrong (Dyynamic Calc), the tool will stop. P.S. You can use this for subhierarchies as well, not just dimension names. Pretty cool when you're trying to figure out what in a hierarchy has to be stored for Hybrid. P.P.S. Make sure the assignment is legal — think of the dynamic parent can't be a label only member if there's just one child (I think I have that right) — that'll cause it to stop as well. Cameron, thank you for checking this. OP, please let me know if it still doesn't work for you.